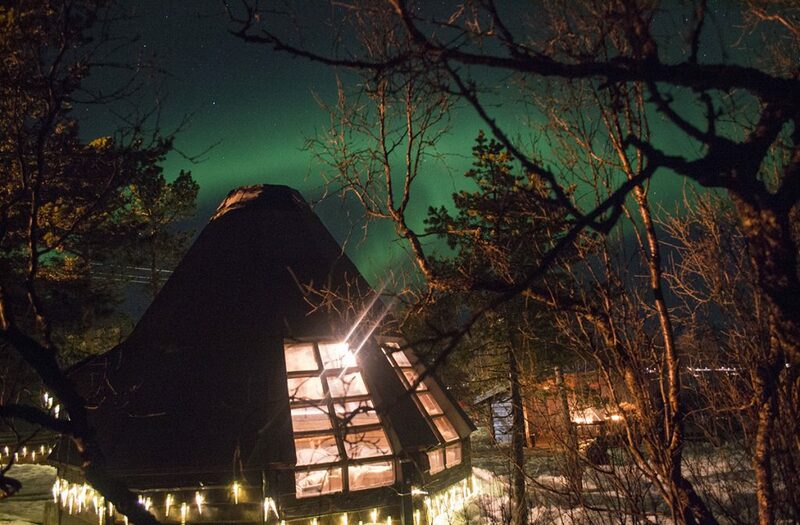 Millions of people have ‘see the Northern lights’ at the top of their bucket lists, and for good reason. A natural phenomenon that’s beguiled citizens of the Arctic for centuries, glimpsing the Aurora Borealis is an experience like no other. It also involves a sprinkling of luck, good conditions and the right time of the year, so it’s not always a complete guarantee that you’ll see them. With the right preparation and knowledge, though, you can definitely increase your chances. Based on my experience in January 2018, here’s what to expect from heading out to chase the Northern Lights in Tromso, as well as a few tips on how to boost your luck! This is the most obvious part of this post, but it goes without saying. 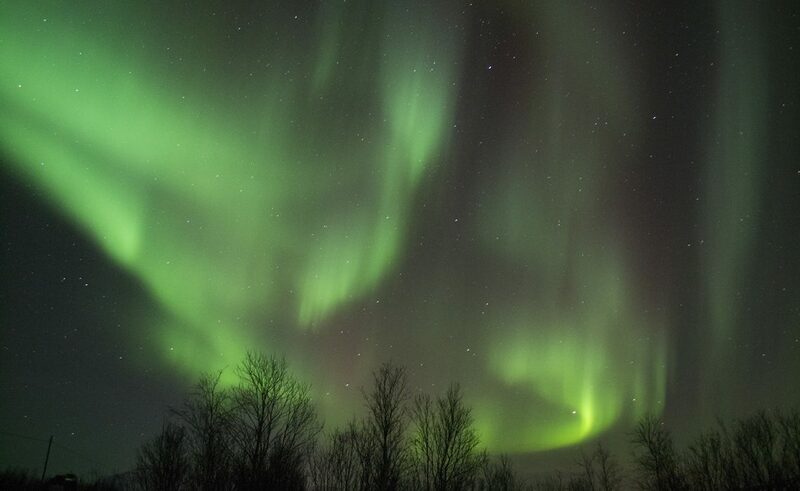 If you want to see the Northern Lights, you have to go to where they’re visible. Not only that, you have to go at the right time of the year. 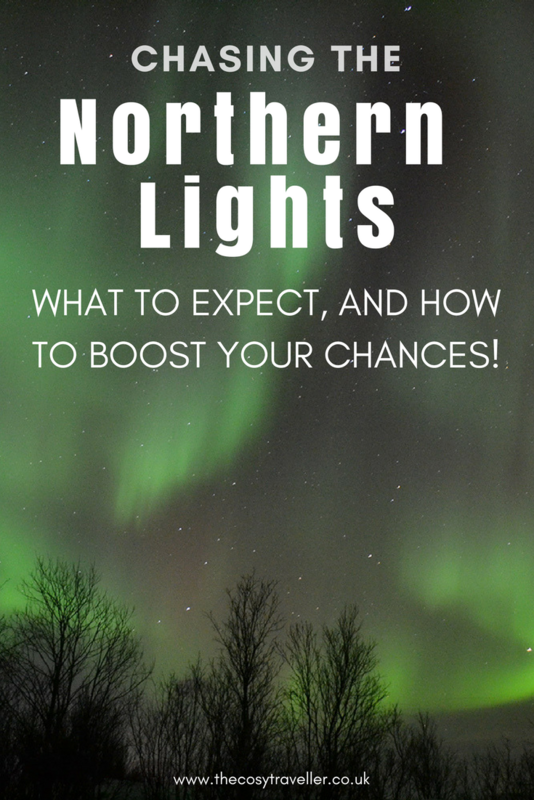 Typically, Iceland, Norway, Finland and Sweden offer the best chances (we saw the lights twice in Tromso, Norway, which is well-known for its good chances of catching the Northern Lights). And usually, anywhere between September and March is a good time to spot them. 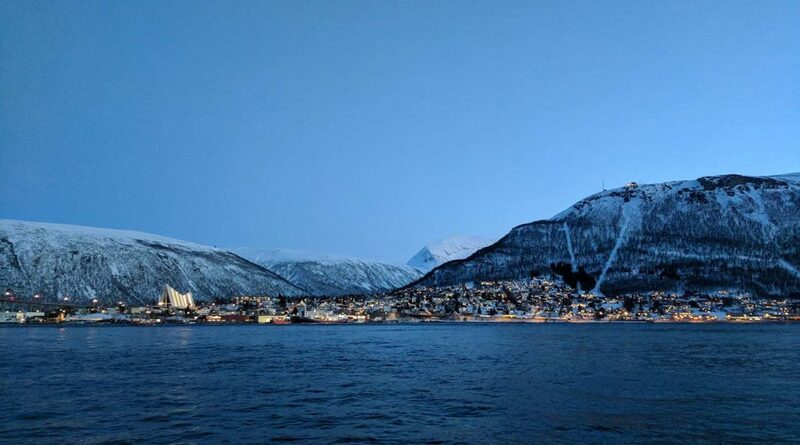 Between the end of November and mid-January, Tromso experiences ‘Polar Nights’, which is where the sun doesn’t break the horizon, leading to 24-hour darkness. Of course, 24 hours of darkness is going to give you a better chance at seeing those lights! I’ve read that the lights are particularly active around the time of the spring equinox (20th March) – whether or not that’s true I’m not sure, but you may want to take the risk! This was taken on our first day in Tromso at 2:30pm! My main advice to you would be to definitely sign up to a tour. While the Lights occasionally appear over cities, towns and other residential areas, the recommended advice (to boost your chances of seeing them) is to get out away from light pollution from houses/street lights, etc. Unless you’re super confident driving in snowy conditions, have a knowledge of where to go and what to look for in the sky, I’d 100% advise you sign up to a tour – The Northern Lights tours aren’t just providing you with transport, they’re providing you with the skilful knowledge of people who’ve tracked the lights down hundreds and hundreds of times. They know exactly where to go to increase your chances of seeing the lights, so use them to your advantage! I’m going to say what we all already know: Norway is an expensive country to visit. And the tours are no different. Be prepared to fork out a pretty penny for the experience (evening tours can be anywhere between £100-£150pp), and maybe think about combining experiences so that you don’t miss out on other cool things in your destination. 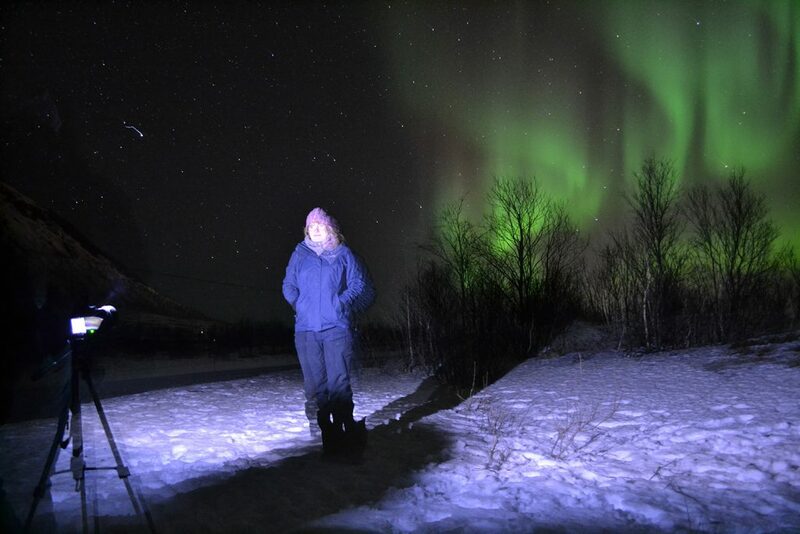 In Tromso, Ian and I combined a stab at seeing the lights with a visit to Tromso Villmarkssenter’s husky camp. We saw the lights and got to cuddle puppies, which has got to be a major win?! Be aware that disappointment is a real possibility. Obviously there are ways to increase your chances of seeing the lights, but there’s never any guarantee. Look into the tours and, if you can, book yourself onto one that offers a free spot on another tour if you’re not successful. Again, there’s no guarantee you’ll see the lights on THAT tour either, but at least it’s boosting your chances! You never know how your evening’s going to go – whether you’ll be treated to a display within seconds, or have to wait until 2am – so be prepared for all eventualities. We were standing in one spot at -8°C temperatures for around two hours. While we had access to the van, it wasn’t easy to keep warm (despite the thermal base layers, ski trousers, thermal jacket, gloves and socks…). Even my boyfriend, who generally starts sweating as soon as the temperature reaches double figures, felt the cold. It might sound counterintuitive to take layers off, but once you’re in the vehicle, remove your shoes. Your feet need circulation and access to air, which will warm your feet up in minutes to help make you feel a bit more human. I was so grateful for this tip on our first night out chasing the Northern Lights!! 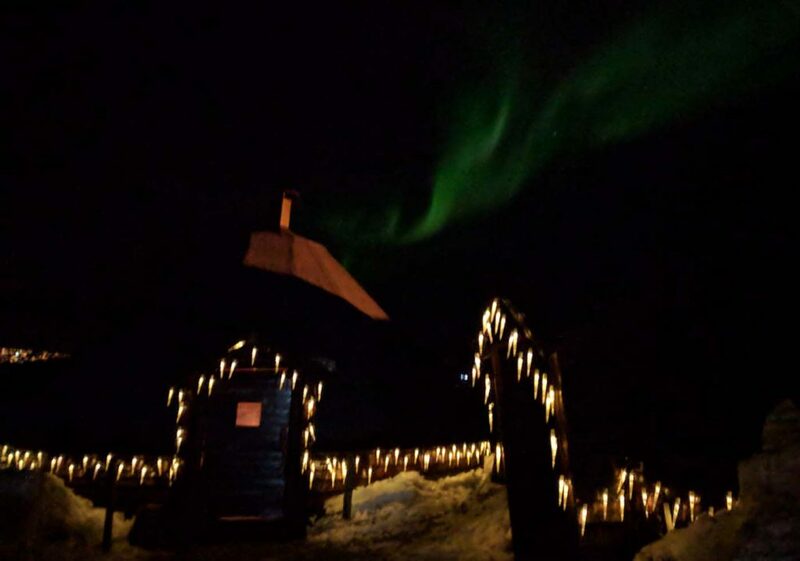 Before you head out to the Arctic in all your thermal gear, you may have the grand notion that the Northern Lights will appear just as vibrant and colourful in real life as they do in those impressive photos we’ve all seen. Scrap that thought. While the lights can appear in a variety of vivid colours, the reality is that they can also appear in a range of other hues too – including grey. Honestly, being told that a vague band of grey in the sky was the Northern Lights was one of the most underwhelming moments of my life. But you’ve got to remember that even that is way more than the majority of people have ever seen. Plus, with the right camera equipment, the lights will still appear as a green smudge in the sky which is exactly the kind of photo that you’ll want to frame and put on your windowsill. Or, at least, cameras which offer you a bit more flexibility with your settings. You’ll need to open the exposure for upwards of 10-15 seconds, which means you’ll also need a tripod to get stable, sturdy shots. Have these tips helped at all? If you’ve been lucky enough to see the lights too, is there anything you’d add? If you liked this post, you might like these too! A full-time food and travel writer in London, with a desire to see as much of the world as possible. 20+ countries over 3 continents so far – and countless cups of teas sampled all over the world. 1) Clear sky. You can’t see them through clouds, so if it’s snowing, raining or lots of cloud, you won’t see them. 2) Solar activity. The lights are caused by the output of solar flares burning up in our atmosphere (simple non-science explanation; magnetism is probably involved somewhere as well). It takes a few days for flares on the sun’s surface to reach us, so you’ll usually get a couple of day’s notice of improved chance of seeing the lights. This is not a guarantee though. You can get apps and websites that forecast both of the above. Then you ‘simply’ drive out into the countryside, find a nice spot, park up and wait. This is where a tour has an advantage, because they know good places to go, where you’ll be away from light pollution and have an interesting foreground (for the photographers). For photography, you need a tripod and a camera with full manual control. Use a wide angle lens, focus on infinity, aperture wide open and shutter speed usually around 10-20 seconds (above 20 seconds, the stars will start to streak). Set everything up in advance, point the camera where you think the lights might appear (usually to the north) and wait… You might need to adjust shutter speed and composition depending on where and how the lights appear. Most importantly, dress warm. There’s a lot of standing around in the arctic cold. If you’re freezing your bits off, you’re not going to enjoy the experience. The thing that surprised me most was that the lights are silent. I don’t know why, but I expected to hear electric crackling, or a light sabre buzz, or the chimes of angels ringing handbells. The silence made it all the more surreal. Great points there! I know some people get super lucky seeing them over Tromso (or other cities! ), but to boost your chances you need to get somewhere with little light pollution. At the end of the day, it’s all about being in the right place at the right time – it’s so super hard to predict. You could go there at the height of the Northern Lights season and still see nothing! I definitely wouldn’t feel comfortable driving around the area by myself, but I know that others would be fine with it. For the combination of convenience, professional knowledge and photography know-how, I’d always recommend a tour for first-time visitors/first-time Northern Light seekers who are there for just a few days.